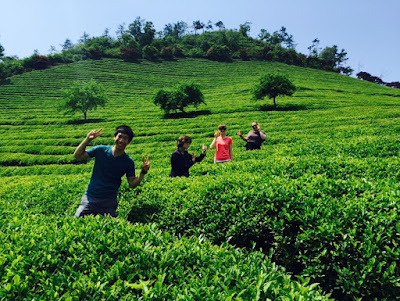 One of the places I had had on my Korea bucket list for some time was Boseong, a southern county in Korea that is famous for its green tea fields. The only problem with crossing this one thing off of my bucket list is that Boseong is really far from Mungyeong, and would require multiple long bus rides to get to from here. Luckily, one of my friends in town who has a car was also interested in going, so we were able to arrange a group road trip to this gem of a town. We left town bright and early, around 6:30 AM, and began our drive down south to Jeollanam-do, Korea's southernmost province (apart from Jeju). In all, the drive took around 4 hours, although it certainly didn't feel that long (maybe I've just driven to upstate NY too many times...but 4 hours doesn't actually feel all that long). When we first arrived in Boseong, the GPS took us to one tea field, which ended up not being the main one we were looking for. After a quick ice cream break (green tea ice cream break, I should say), we walked around for a bit and noticed what would ultimately end up becoming a theme for the weekend--there was a whole lot of green. These fields were nice and all, but I knew we weren't in the right place because they didn't look like the ones I had seen pictures of online, and I wasn't blown away like everyone said I supposedly would be. They were perfectly lovely, but not worth a four hour drive. We got back in the car and a after two minutes we found what we were looking for, Daehan Dawon Green Tea Plantation. We knew we were in the right place because everything suddenly became touristy--there were lots of cars, tour buses, signs, and people. We decided to eat before we went in to see the plantations, and we were all happy to see a menu full of green tea-themed items. I ended up ordering the bibimbap, which was made with green tea vegetables (whatever that means?) and green tea rice. The rice actually did have a tint to it, and had a slight green tea taste to it as well. 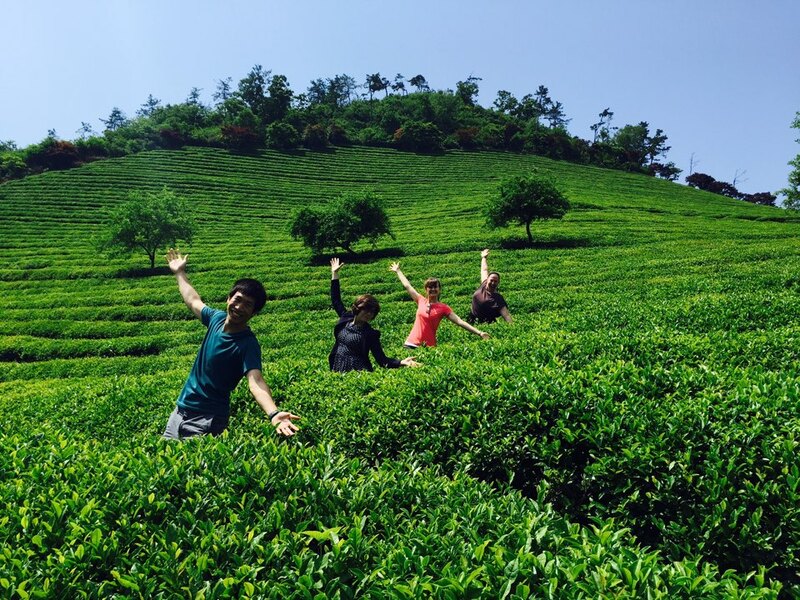 Following lunch, we bought our tickets and made out entrance to Korea's most famous green tea plantation. It didn't take long for us to be in awe of the huge hills filled with green tea bushes, and we just couldn't help but remarking at how green everything was. Row upon row was perfectly maintained. We climbed up to the top of the fields, which ended up being quite the workout consisting of practically all stairs. The view at the top was definitely worth it though, as we could overlook all of the fields and even get a glimpse of the sea in the distance. We came back down and ended up on the other side of the plantation. Here we again saw row upon perfect row of bushes. The view was really one of those that can't be captured on camera, although we did of course try. After we walked around for a while, it was time for a snack break. Naturally, these snacks had to be green tea themed. I only got an iced tea, but among other things there were also green tea ice cream and green tea churros for sale. After our break, it was time to head to the bamboo forest, which was just a short walk away from the tea fields. I've seen other bamboo forests, but I have to say, this was the most impressive I think I've seen because the bamboo was so tall. We didn't spend a whole lot of time here, but it was still cool to see. After we finished in the bamboo forest, we purchased a few souvenirs, then we were off to our next scenic destination. We had read that there was a stop where you could get a great view of all of the tea fields, so we decided to pull over and take a look, and boy was it worth it. The view was breathtaking, and no pictures could really capture the whole thing. Green tea ice cream while looking at this view. Does it get any better? After we finished taking in these views, we made a short ride over to Suncheon, a nearby city, where had heard that there was some sort of castle/traditional village. This turned out to be Naganeupseong Folk Village, which contains lots of traditional houses where about 100 families still live today. This village really did feel a bit like stepping back in time. We were surrounded by beautiful mountains, and the neon lights of Korean cities felt a world away. Just some cows roaming around. We spent a good amount of time walking around and taking in the village before leaving. By this point the sun was starting to set, so we made our way into the city to check into our hostel. After dropping our things off, we met up again for dinner. 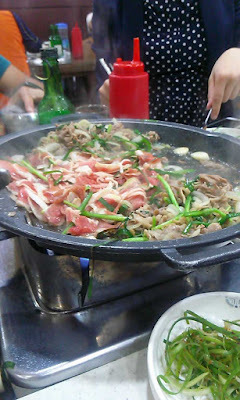 One of our friends happened to know a local who lives in Suncheon, so we met him for dinner at a duck restaurant. Now, I've had duck plenty of times while I've been in Korea, but this was far superior to anything I've had before. Jeollanamdo is actually famous for having some of the best food in Korea, and time after time on this trip we definitely weren't disappointed. This "Suncheon-style" duck was no exception, and since we were apparently in a college-area, the price was right--only about $10/person for LOTS of food and some drinks. After dinner we grabbed a drink, by which point I think my eyes were starting to close mid-conversation. It had been a very long and busy day, and we still had a full second day ahead!